Recruitment of Various Post at Odisha State Civil Supplies Corporation Limited Selection of service provider for Digital Signing Component for Directorate of Legal Metrology (DLM) Terms of Reference For Selection of service provider for Digital Signing Component for Directorate of Legal Metrology (DLM), Govt. of Odisha Corrigendum-II to original RFP No-02/OSCSC/2018 /Date 28.09.2018 Corrigendum -I -dt-12-10-2018-to-RFP-No-02-OSCSC- Engagement-of-Recruitment-Agency RFP FOR ENGAGEMENT OF A RECRUITMENT AGENCY TO CONDUCT RECRUITMENT FOR DIFFERENT POSITIONS Corrigendum-I Dated 16-8-2018 to RFP No 03-FSCW Dated 1-08-2018 for Printing of Ration Cards Implementation of the State Food security Scheme for providing food security to poor, distressed and eligible person. RFP for Printing, Lamination and Transportation of Ration Cards to All RCMS Centers At Block-ULB level Under PDS Fresh bids are invited for Unit No-02, Ref-RFP No.01/OSCSC/2018 dated 17/04/2018 (Supply of Manpower for OSCSC Ltd.) CORRIGENDUM-II to RFP No.02/FS&CW/2018-Dt-18-06-2018 CORRIGENDUM-I to RFP No.02/FS&CW/2018-Dt-18-06-2018 RFP for Supply of Qualified Data Entry Operators for Functioning of RCMS Centers. GOVERNMENT OF ODISHA DIRECT SELLING GUIDELINES ORDER-2017 CORRIGENDUM-II, Dt.28-3-2018, to RFP No.01/FS&CW/2018, Dt.20/ 02 /2018, for Setting Up of RCMS Centers CORRIGENDUM-Dt.3-3-2018, to RFP No.01/FS&CW/2018, Dt.20/ 02 /2018, for Setting Up of RCMS Centers Request For Proposal (RFP) for setting up RCMS Centers at Block/ULB and DGRO points Odisha Public Distribution System (Control) Amendment Order, 2018. The Odisha Direct Selling Guidelines Order, 2017. Building Efficient for P-PASS and SCMS for the TPDS in Odisha. Food and Procurement Policy for the Kharif Marketing Season (KMS) 2017-18. Advertisement of Odisha State Food Security Rules, 2017 Draft Notification of Odisha Food Security Rules 2017 The Odisha Specified Food Stuffs(Stock holding limit and Licensing) Amendment order-2016. The Odisha Specified Food Stuffs(Stock holding limit and Licensing) order-2016. Food and Procurement Policy for the Kharif Marketing Season (KMS) 2016-17. Postpone of the interview of member(w). Corrigendum-2 to RFP for FPS Automation No.06-FSCW-23.04.2016. Corrigendum RFP for FPS automation RFP for FPS Automation The Odisha Rice and Paddy Procurement and Custom Milling of Rice Oder, 2016. Odisha Public Distribution System (Control) Order, 2016. 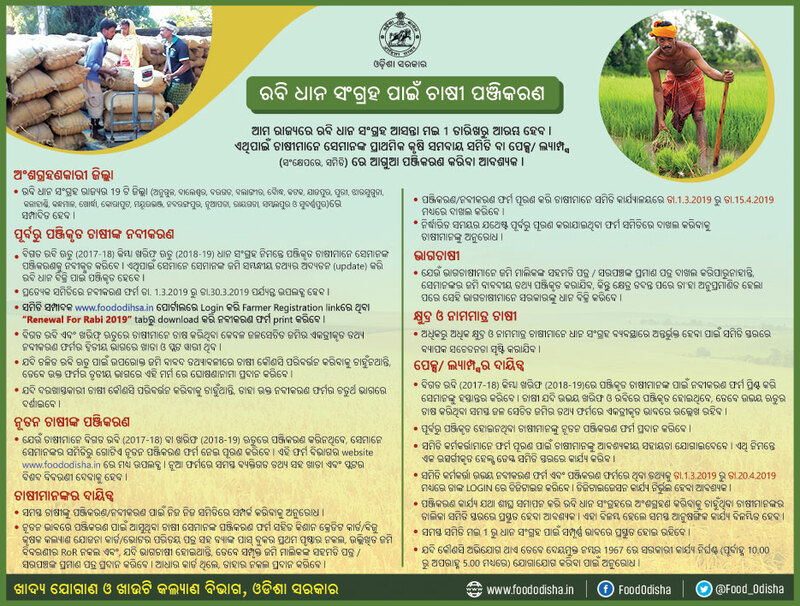 Odisha State Food Commission Rules, 2016 Food and Procurement Policy for the Kharif Marketing Season (KMS) 2015-16. Department Storage System Guidlines II. Tender call notice for providing two number of Non AC/AC Diesel driven vehicles(Bolero) having sitting capacity not more than nine including Driver. RFP for Supply of Qualified Data Entry Operators for Functioning of RCMS Centers. Regarding Auction Sale Notice of Staff Car bearing No. OR-05-L-8800 of the State Consumer Disputes Redressal Commission. Auction Sale Notice of Staff Car bearing No. OR-05-L-8800 of the State Consumer Disputes Redressal Commission, Odisha, Cuttack. Standard Bidding Documents (Annexure-I, II & III) for providing vehicles for Legal metrology, Khandagiri. Tender Call notice for providing 1(one) number of Diesel driven Indigo (AC) car having sitting capacity not more than five including driver. Tender Notice for disposal of Maruti Omni (Petrol) bearing No. OR-02-L-8078. ????? ????? ? ????? ?????? ????? ????? ????? ??????? ??? ??????? ?????????? ??? ? ??? ???? ????? ?????? NFSA'2013 ? ???? ????? ???? Ration Card Application Form under NFSA-2013. NFSA ????? ????? ???? ? ???????? ???? ???????? Analysis of Block/ULB wise applications for NFSA Beneficiaries. ????????? ????? ???? ?????? ???? ??????? Application Form (Hand Written) Online ?? ??????? Online Application ????????? ????? ???? ?????? ???? ???????????? ?